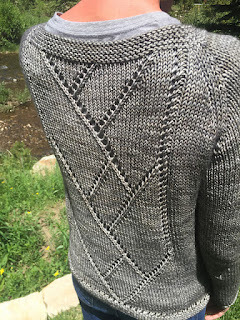 While browsing this morning, I came across "Center Street," a free pattern from CJOriginals just posted this month. The oversized boatneck sweater is very similar to a very first knitting project I took on about six decades ago, believe it or not. 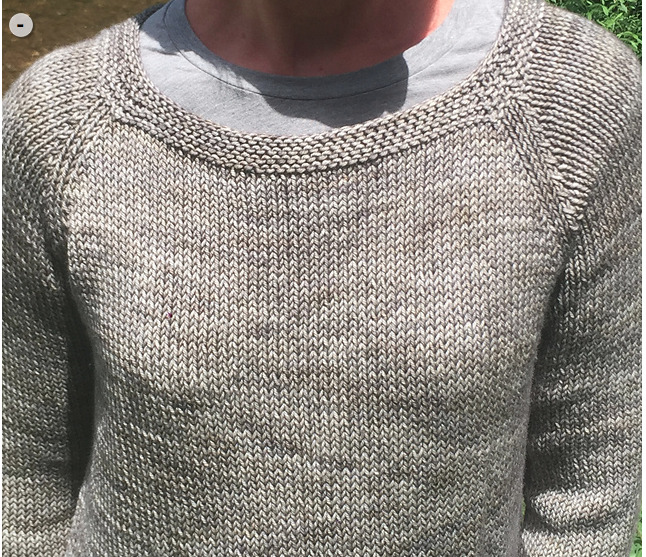 The yarn was a brown worsted and the jumper pattern was worked in the round with raglan sleeves. But the best part of "Center Street" is the interesting detail worked with very simple stitches along the sweater bottom edge and on the back. 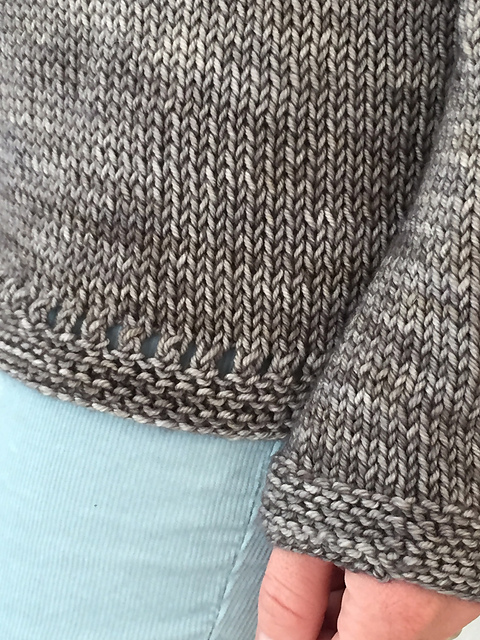 Worked on a US 8 (5mm) circular needle with raglan sleeve shaping, this sweater design is very trendy and has a generous size range of 35-54 inches (89-137 cm). 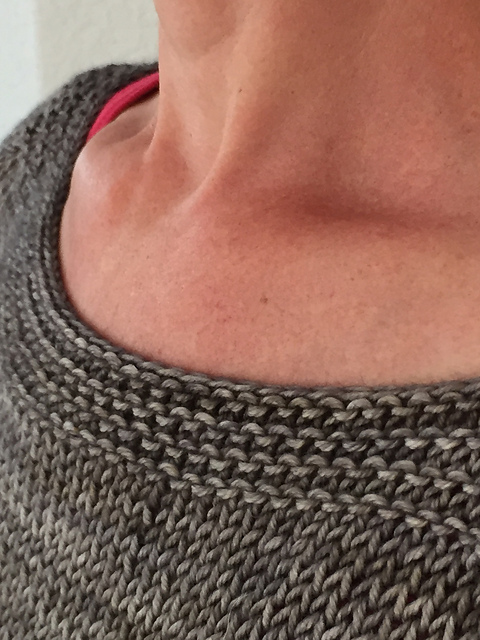 Note from designer: this pullover boatneck pattern is designed to be worn 2-4 inches larger than actual bust measurement. 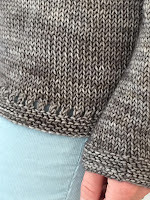 The sweater edge and cuff details are worked with a simple combination of stitches, very charming. The jumper pattern knits up with 800 to 1200 yds, although there is no mention of how many skeins per individual size. Just count on 4 to 6 skeins or somewhere inbetween (200 yds per) in the suggested yarn at Western Sky Knits. Looks like beautiful yarn, the colorways are gorgeous, but somewhat pricey at $28.00 a skein. However, it is superwash Merino, cashmere, and nylon. 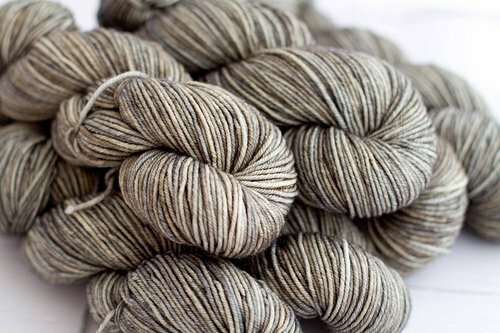 Valley Yarns Wachusett is on sale now 70% Merino and 30% cashmere, but it isn't superwash, and less yardage (163 yds) at $13.99. So you will find some savings there, if you are willing to give up a few things. Always check and be mindful of the gauge as well. Add this free sweater pattern to your library on Ravelry. A tutorial for "Center Street" is here at Knotions. All photos in this post are the property of CJOriginals.